MWC 2013 – On your marks, get set, go! Yes, I know we are all busy with final plans for this year’s MWC, but how about 2013? This is the final year that the GSM congress will be at the current Fira venue. 2013 sees the GSM congress move to Barcelona’s second Fira – the Fira Gran Via, in the Hospitalet district of the city, about a 10-minute drive east from the current venue. 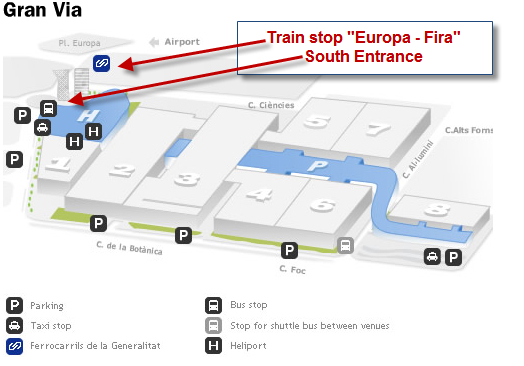 There is a close by metro stop (Europa Fira), opposite the south entrance of the exhibition venue, and parking for up to 4,000 cars on site. The Hospitalet area has been under constant development over the past few years, with new bars, restaurants and hotels appearing almost every week, meaning there will be no shortage of new local finds just waiting to be discovered by the congress crowd. Halls 1 & 2 – hospitality only spaces. Hall 3 – combined hospitality and exhibition spaces for bigger exhibitors – these are large-scale spaces of 200sqm or more. Hall 4 – the conference venue. The media centre will be located between halls 3 & 4. Halls 5, 6, 7 and 8 will be the main exhibition halls, with hall 8 set over two levels, exclusively for App Planet exhibitors. And, if you’re tired of the same dry sandwiches from the same vendors at the current mobile congress, you’ll be pleased to hear that each hall has a much greater variety of eating options, and there is also a fine dining restaurant situated next to the South Entrance. There is also outside space is located off the majority of the halls, on both the upper and lower levels – useful for those times when you need a break away from it all. The GSMA are offering exhibitors at this year’s event the opportunity to explore the new venue on a first come, first served basis. The next visits are scheduled for the afternoon of Wednesday, January 18th, and the morning of Saturday 25th February (the Saturday before MWC 2012). Places can be booked by contacting your GSMA MWC representative.